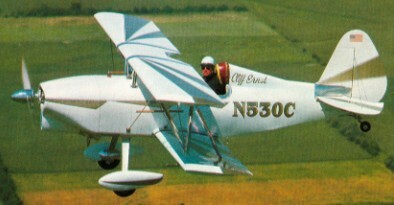 In 1955, the EAA decided to develop a single-seat sport biplane as a service to its members. The prototype was built as a classroom project by students of St.Rita’s High School in Chicago. It flew for the first time on 10 June 1960. The E.A.A. Biplane was designed in response to many requests from members of the American Experimental Aircraft Association for a single seater sports biplane of simple yet rugged construction. The fuselage consists of a welded chrome-moly steel tube frame, to which are fitted plywood formers and wooden stringers, the whole being fabric covered apart from the aluminium coaming panels. Both upper and lower wings have solid spruce spars and built-up wooden ribs, and are internally and externally wire braced. The leading edge to the front spar is aluminium covered, the remainder being fabric covered. Interplane and centre section struts are made of streamline steel tube. A 9.5 Imp. gallon fuel tank is fitted behind the firewall. The empennage, like the fuselage, is built up of welded steel tube and is fabric covered and externally braced. The ailerons which are installed on the lower wing only, are operated by means of push rods, while the elevator and rudder are cable operated. The main undercarriage is built up of steel tube with bungee cords for shock absorption. Engine: Continental C-85, 85 hp. Wing span: 20 ft 0 in (6.1 m). Wing Area: 108 sq. ft. Length: 17 ft 0 in (5.18 m). Height: 6 ft 0 in (1.83 m). Max TO wt: 1150 lb (522 kg). Max level speed: 125 mph (201 kph).